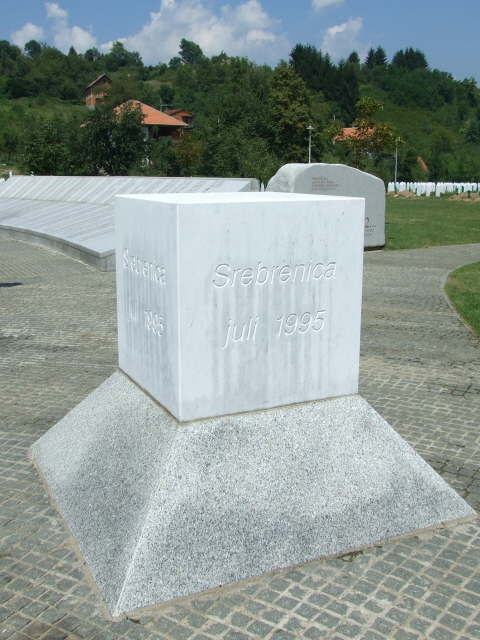 The memorial for what is known as the Srebrenica massacre, or even Srebrenica genocide, committed in July 1995 by Serbs against Bosniak Muslims during the war in Bosnia-Herzegovina. The site today is basically a cemetery, where some 6000 victims of the atrocities are buried, and continue to be buried once identified … which is an ongoing process. In addition there is a kind of museum in the nearby former car battery factory, where many of the victims had tried to seek refuge. 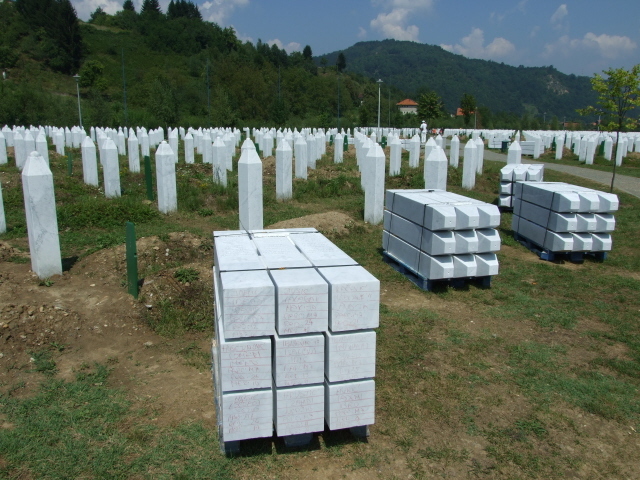 Srebrenica stands for the worst genocidal atrocities committed in Europe since the Holocaust. Here the "never again" pledged after WWII was truly nullified. Given the significance of the events of 1995 and because it was only so recent, visiting the site is heavy-duty dark tourism, also in view of the remoteness of the site. This is not for the casual dark tourist but only for the really committed. More background info: Srebrenica is the agreed cover term for a series of massacres and "ethnic cleansing" committed by the Serb forces, under General Ratko Mladic, in the latter stages of the war in Bosnia and Herzegovina in July 1995. 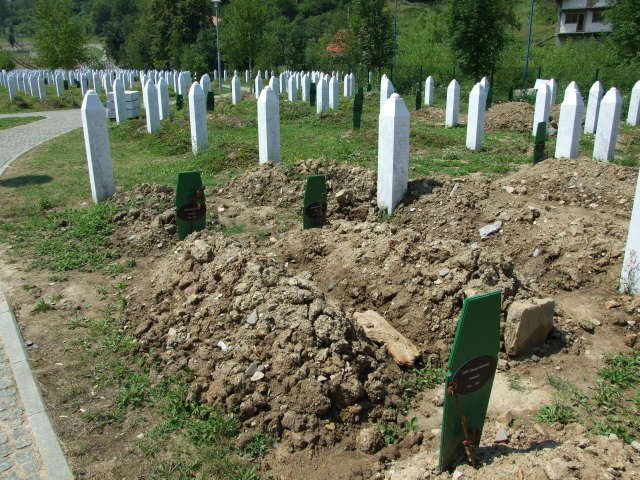 Over 8000 Bosniak men between 14 and 65 years of age were killed (plus a few women too) and buried in mass graves, and up to 30,000 were displaced (esp. women and children), when the "Army of Republika Srpska" went in to "re-claim" Srebrenica for the Serbs. After the fall of Srebrenica, families were separated, women, children and the elderly were carted away in buses, while the remaining men were either slaughtered at the site or tried to flee on foot over the hills to Tuzla – but the majority of these were murdered too on the way. 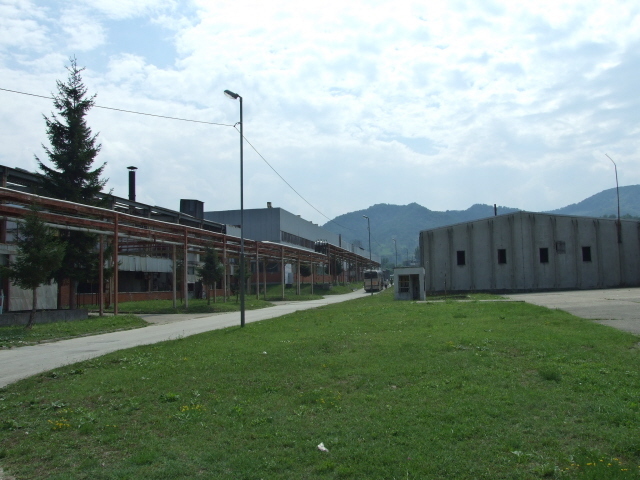 One aspect that makes Srebrenica particularly painful for the outside world is the fact that Srebrenica had been a "UN safe area" – but the Dutch UN protection forces in Potocari were unable to prevent or stop the atrocities, being under-equipped, understaffed and unprepared for the task. Some of these Dutch soldiers are also still deeply traumatized from the events at Srebrenica to this day. Since the victims were targeted solely on the grounds of their Muslim Bosniak ethnicity, the atrocities are regarded as an act of genocide – such was also the verdict by the International Court of Justice and the International Criminal Tribunal for the Former Yugoslavia (ICTY). The application of the term 'genocide' is contested (as you would expect esp. by Serb nationalists), as only adult men "of military age" were killed … although that included boys of just 14 years of age. Of the over 8000 dead, about three quarters have by now been identified and buried at Potocari. The identification process (mostly through DNA analysis) is a complicated issue, exacerbated by the fact that bodies were often exhumed and reburied in an effort to cover up the war crime – often using heavy machinery such as excavators. So body parts of the same victim have ended up in different locations. 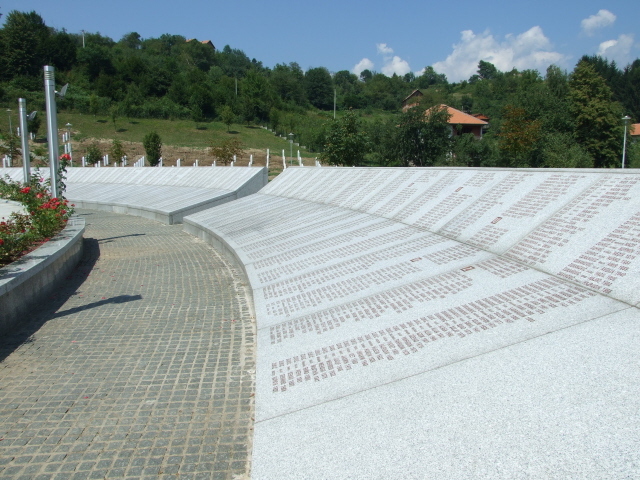 The memorial site was opened in 2003 in the presence of Bill Clinton, who had been president of the USA at the time of the Srebrenica atrocities (and who brokered the Dayton peace agreement that ended the Bosnian war). What there is to see: The main part of the Potocari memorial site is the actual cemetery where the victims are buried, and continue to be buried once identified. Most graves have slim, tall white marble headstones, newer graves still have green wooden temporary markers with just the person's name, a place name, and year of birth (and the common year of death: 1995) indicated on them. In the centre of the complex a memorial wall of names forms a semi-circle around a kind of open-air mosque, the central memorial space used in burial and anniversary ceremonies. 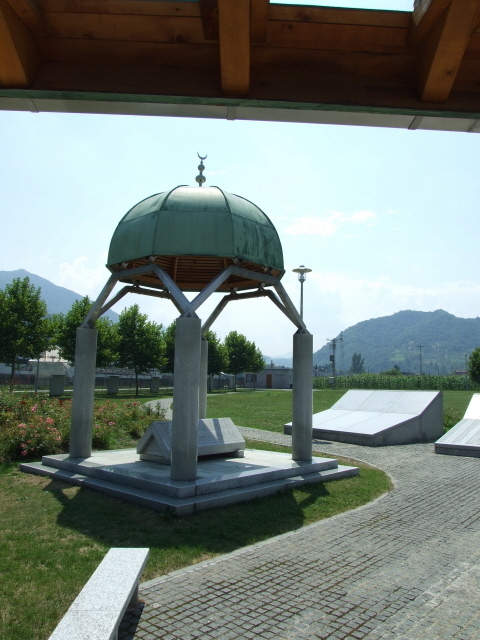 Several memorial stones and a modern turbe (a stylized Muslim mausoleum/tomb) complement the ensemble. To the right of the main entrance to the cemetery there is a small nondescript building in whose subterranean exhibition room a small but very moving selection of photos (blown up to large scale) was on display when I visited (in August 2009) – whether it is a permanent exhibition or not I cannot say. The image that gripped me most was that of a half-decomposed hand of an exhumed victim held in the rubber-gloved hand of a forensic examiner – it almost looked like they were really "holding hands". Very eerie. Across the road is a small souvenir stand – but the information material on sale there is almost entirely in Bosnian only (although I spotted one book in German). Behind the souvenir stall lies the former car battery factory where many victims are said to have tried to take refuge. One building usually houses the coffins of new arrivals before their ceremonial burial at the cemetery. Just south of the factory you can see the former UN building, where the Dutch protection forces failed to protect the Muslim population and refugees … it now lies abandoned. One of the derelict factory buildings, however, has been turned into a Memorial Room ('hall' more like). This is by far the most impressive part of the site (the London Imperial War Museum had a hand in putting the exhibition inside together!). Unfortunately access to it is restricted (see under access and cost) – normally only open for groups, or so I was told by a local guide. But a large Turkish group was visiting at the same time as me, and I was allowed to tag along. The memorial hall is impressive for its sheer size alone. 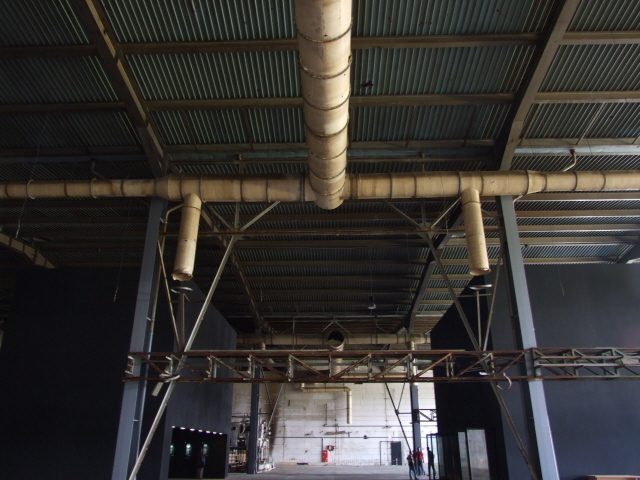 An enormous mostly empty factory hall, with just a few bits of machinery still sitting in a corner. Along the left wall, several text panels in Bosnian and English as well as maps, charts and photos give information about Srebrenica and the genocide. In the centre of the hall, two black square edifices contain the video cinema and further displays, respectively. The displays consist of individual artefacts, such as wedding rings, prayer beads or diaries found with the exhumed victims or donated by family members. These are accompanied by the individual stories of the relevant people. About 20 such individual stories are represented. This manages to personalize the atrocity, thus complementing the bare facts well. The film shown in the cinema is extremely impressive too – it contains lots of original footage from 1995, including Ratko Mladic's parade through empty Srebrenica and his preposterous ramblings about revenge for Turkish occupations of Serb lands … Some images are more graphically gruesome, including footage of an actual execution. Witnesses' and widows' testimonies are cut in between the original footage. The ca. 25 minute film really left everyone pretty much speechless for quite a while. Location: Srebrenica is about 50 miles (80 km) north-east of Bosnia and Herzegovina's capital city Sarajevo (and just five miles or so from the border with Serbia) – that's as the crow flies – on the road it's more than twice that, thanks to the winding roads and hairpin mountain passes. 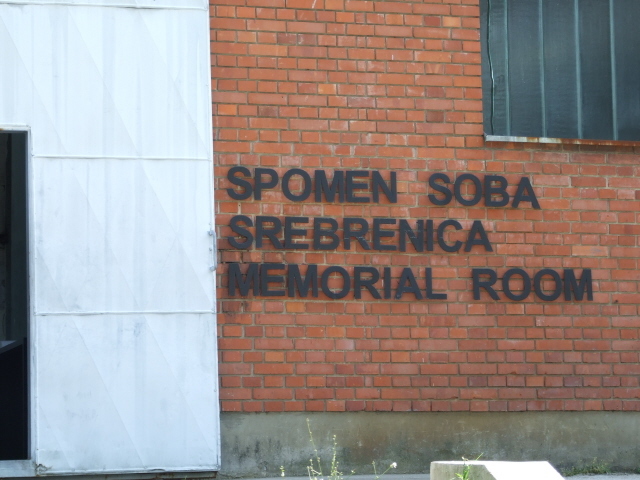 The Potocari memorial site is not actually IN Srebrenica, but ca. three miles north of the town on the 453 road to Bratunac. Access and costs: remote and can be either complicated or costly. Details: Srebrenica is about two to three hours drive from Sarajevo. You could drive your own car or hire one, but navigation in these parts isn't the easiest. Signposting is scant and mostly in Serbian Cyrillic only, so you'd need to be able to read that script or you're bound to get lost. Needless to say, a good map is paramount. To make things easier you could hire a car with driver. That's what I had to opt for when I visited in August 2009 as I had forgotten to take my driving licence. It roughly doubled the cost (to 110 EUR) but I was glad I did it, because I'm sure I would have had a very hard time navigating the route. Plus the driver doubled up as a guide/interpreter at the site, which was a valuable bonus. 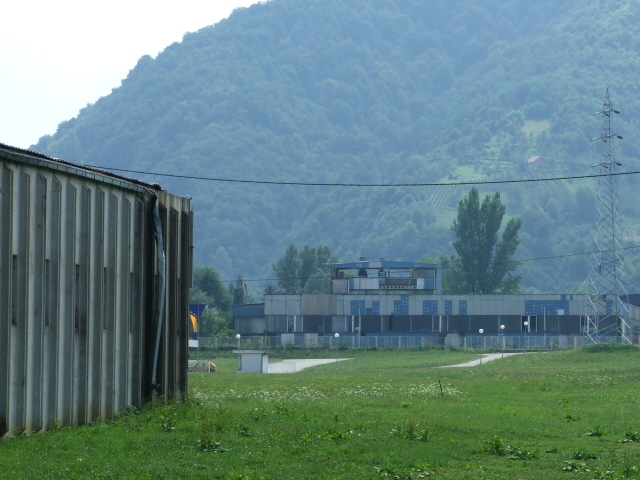 You can in theory get to Srebrenica on a shoestring too – there are two to three bus connections daily from Sarajevo, but note that the memorial site at Potocari is about three miles north of Srebrenica itself! There is no admission fee and the cemetery/memorial is open at all hours. However, access to the memorial hall in the former battery factory is much more restricted: in theory it is only open to groups, or so I was told at the site, but I was allowed to "latch onto" a Turkish coach party that was there at the same time. Lucky. The film about Srebrenica screened in the memorial hall is apparently shown only twice a day, at 11 a.m. and 1 p.m., so make sure you time your visit accordingly and hope for the presence of a group to latch onto – or arrange to be part of a tour. Such tours are now offered by a couple of specialist operators in Sarajevo. Time required: For the memorial and cemetery you may not need more than half an hour, if that, but the memorial hall in the battery factory, if you can see it (see access) requires about an extra hour minimum, including the ca. 25 minute film. Getting to Srebrenica will be the most time-consuming element, taking between two and three hours from Sarajevo, thus making the excursion a day trip, basically.